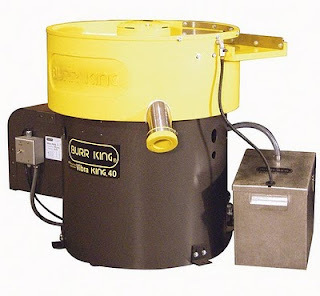 Light Tool Supply: Burr King abrasive grinders, polishing equipment, disc grinders and vibratory equipment. 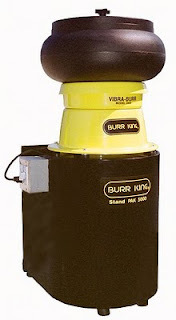 Burr King abrasive grinders, polishing equipment, disc grinders and vibratory equipment. For over fifty years Burr King has manufactured quality abrasive grinders, polishing equipment, disc grinders and vibratory equipment. All of our products are designed in America and manufactured in Warsaw, Missouri. Burr King grinders, polishers, and mass finishing systems have been used by the world's leading companies. Our products use innovative designs of uncompromising quality, they are industrial grade, intended for use on metals, woods, composites, plastics, rubber, stone, fiberglass and other materials. Burr King products are simple-to-use, no nonsense tools preferred by professionals. Parts may be sent to the Burr King factory for a full process test report. Customers will receive their processed parts back with a complete, easy to understand finishing recommendation that lists methods, materials, equipment and time variables. Burr King customers can make informed, low risk buying decisions.